In this story I'm giving a go at, humanity as a whole have been under siege from creatures that can be best described as humanoid demons. Things haven't been going well for the human race, as the demons have greater physical strength, size, pain resistance, and seem to all have a sadistic love of violence. One advantage humanity has over demons is a greater resistance to freezing temperatures. In simple terms, demons will freeze to death faster than humans will. As a consequence of this, humans have started to build towns, castles, and research installations in very cold places to protect them from invasions. However, this has only slowed the conquest of the demons, not prevented it. The humans need a standing army for defense, and demons have no problem changing their equipment to combat the cold. One of my major concerns is steel, and like metals, becoming brittle with prolonged exposure to cold. Even if I'm wrong about the severity of the brittleness, there is also the issue of trying to wear an ice-cold steel suit in the snow. Hypothermia and frostbite are no joke. To the best of my knowledge, actual arctic warfare was rare in these times (since it was better for both sides to wait until spring) so I'm not sure if there are historical examples I can use. I'm all for guerrilla warfare with camouflage and mobility being the priority, but I'd love to see how extreme pure defense could get in freezing conditions. Heavy and durable armor is what I'm interested in if that's even possible with kind of climate. If greater specificity is needed for answers: imagine around 14th century European level of technology and -23°C to +4°C (-10°F to +40°F) temperature (with significant snowfall and wind) to deal with. The problem with this is that you can't have high concentrations of people, because they need a lot of food and you can't obtain them in very cold places. Most tribes living in tundra or similar environments were nomadic or semi-nomadic. Your population could be nomadic and get resources during summer and then retire to fronzen mountains to pass the winter, eating cured meat/fish and dry fruit. If greater specificity is needed for answers: imagine around 14th century European level of technology and -10 to +40 degrees Fahrenheit temperature (with significant snowfall and wind) to deal with. 14th century means people are using padded armor (gambesons) and chain mail over it, with some coat of plates (padded armor with plates of steel sewn inside) and good helmets. All of this is great for cold climates, so armor is well covered. For the weapons, it is complicated. Cold means snow, ice and lack of grass, so we can't use cavalry charges. Bows won't work properly (and the fine wood to build them would be too difficult to find), but the string of the crossbows is also affected by the weather. Your soldiers will need to use javelins for distances (and throwing axes if they can produce several, because axe thrown is a lost axe for the remaining of the battle). 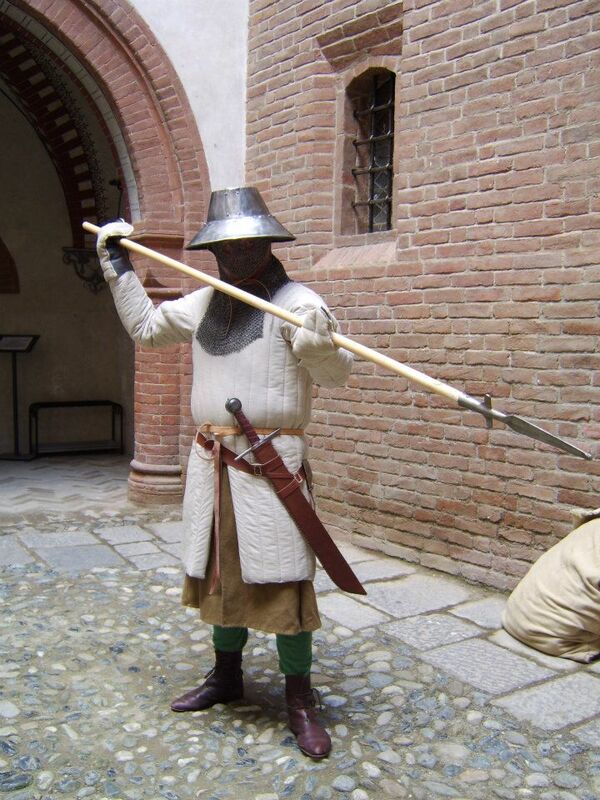 With your "demons" also protected with mail and padded armor, spears with long heads like the Ahlspiess are very good, like all the polearms (fauchards, glaives, lucerne hammers, bec de corbins...). Your demons are stronger than humans, so the humans soldiers will like the reach of those pole weapons. For shorter distances, swords are complicated to train properly (hacking swords like the falchion much less, so they are a good idea against padded armor), but big thrusting daggers would be great for large enemies (so you can stab them in the groin or the abdoment, which are usually badly protected and they can go through chain mail). Hand axes would also be a good idea, but they have an intimidating factor and the terrible wounds they cause if you hit the head, but I think this will be impossible with tall demons with pain resistance and who love violence. Winter warfare (at given temperatures, which I would not call "Arctic") maybe uncommon, but absolutely realistic. For example, in the XIII century, Batu Khan's conquest of Rus' (a predecessor of Russia) was conducted primarily by winter campaigns, when temperatures were certainly plunging below -10F/-23C. Steel is not particularly more brittle at these temperatures. Frostbite from steel can be easily negated by padding. In fact, medieval combat attire, complete with things like Gambeson is notoriously prone to causing overheating. Fighting just below freezing point will be a bliss. If temperatures will go down to -20C and below, then frostbite of open skin will become a concern, which can be negated by wearing balaclavas. The main problem with winter warfare is movement and logistics. Batu Khan utilized frozen rivers as roads, but generally speaking, making any kind of movement, especially for heavily armored people will be very hard. Another general issue with the entire cold climate premise is the need of supply. People can build castles in the cold, it's not a big deal, but those castles need to be fed and supplied from warmer places (like Castle Black in "Game of Thrones"). If people are completely abandoning temperate lands, cold climate outposts would not be able to survive by themselves. P.S. The issue of "hot when moving/cold when standing" had been (and still is) addressed by cloaks. When fighting, the cloak would fly back on one's shoulders like a cape. When standing, one would wrap oneself in the cloak, getting protection from elements. To address the obvious problem about cold, have you ever gone on a walk/hike in winter (5-25 degrees F)? Simply walking with a heavy coat and boots makes you extremely hot. Add an inch of loose snow, and the heat from the effort to walk becomes incredible. Lack of heat in a moderate winter is going to be the least of your problems during battle--overheating is more likely. If they will be fighting in sub-zero temperatures, cold could become an issue, they would probably make a light jacket of wool and wear it under the armor to trap heat. Maybe put a cloth lip over any metal pieces near skin to help if someone accidentally touches it. Now for the fun part: heavy cloth can actually provide excellent armor in itself; this could actually make their armor significantly more effective--especially if they wear multiple layers. Given the above point, metal armor may not be the best alternative here. 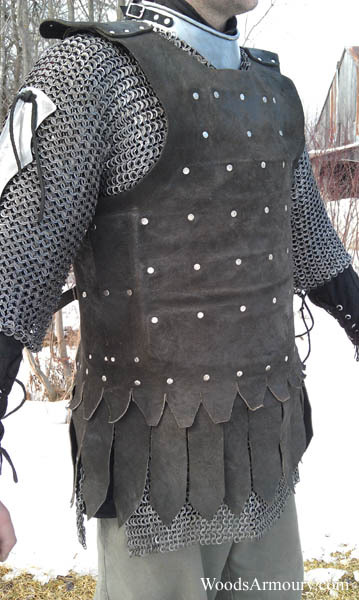 Perhaps you would be better off with a layer of leather or two, and a few layers of wool or other heavy cloth that can provide armor and warmth. This will A) avoid the problems of metal becoming brittle, and B) reduce weight and make you more mobile. Considering you are fighting super humanoids, you probably don't want to get close enough for hand-to-hand combat anyway, unless you significantly out-number them. If it were me, I'd think something like many teams of 2-3 rangers who stalk and ambush individual demons and harry larger groups with ranged attacks. Which brings me to weaponry: ranged attacks (i.e. archery) and traps will probably have the highest return for the cost of life of defenders--and defenders will be at a premium here. Let's say it takes 5 years until someone is ready for serious war training, and another 5-10 years before they are able to join a ranger team. That's 10-15 years you just invested into a warrior; getting them killed would be the stupidest thing you could do. With this type of attack, metal brittleness is less of an issue; however, the Vikings and other northern peoples used swords and spears just fine in the posted temperature ranges, so I'm not even worried about metal brittleness here. Finally, you say "demons have no problem changing their equipment to combat the cold". Well, let's just go kill these demons, loot the bodies, and turn their equipment right back on them! P.S. : I live in Minnesota. We deal -10F for several weeks in the winter without issue, and 40 or lower for about 4 months a year. Which was a series of overlapping plates attached to an outer garment, often worn over chain as pictured. Underneath the chain is a heavy padded garment, underneath which is usually some underwear type garment. The metal is never actually going to touch your skin - that would ruin you no matter the temp. Aside from probably emphasizing good mittens more, you won't have to change armor around. You can easily throw a cloak over yourself if you need more protection. Don't forget that bows will also have some major issues - even at normal ambient temperatures you had to 'warm' them up before full proper use. And at the temps you are talking about there could be issues with bows failing pretty spectacularly depending on their construction. And completely aside from that, people can't survive long term in those kinds of temperatures. Food is going to be a problem. As discussed in this forum, you would not need to alter alot of your equipment. It seems that practical experience has shown that the first layer of clothing is the most important one. As some of the forum members pointed out, keeping you warm is no problem as long as you are moving around, but you will freeze fast as soon as you are standing still for a while. Furthermore, there seems to be an distinction between plate and mail armor considering the effect of wind: Plate armor protects from the wind, while mail just lets it comming through. Regarding weapons... It is mentioned in the before mentioned forum that steel should have no problems until around -40° Celsius ( -40° Fahrenheit). But, just in case, keep some fire places around to keep your troops and equipment warm. Tl;dr: Give them warmer undergarments, fire places to warm them while on duty and good food rations. Should solve the problem. Defense in the medieval ages could be compared to an onion, there was rarely ever only one layer. In castles you had often had multiple gatehouses, moats, etc. In armor you had your plate mail over chain mail over gambeson over your tunic. So while your plate mail and chain mail might be cold they won't be close to contacting your skin. In case you are not familiar with gambesons they are linen or wool jackets with many layers of the fabric with tightly spaced stitches making it very sturdy defensively and due to the number of layers of fabric it can be fairly heavy and very warm, Wikipedia claims it doubled as a winter garment already so it fits your story perfectly and was an extremely common armor. Not the answer you're looking for? Browse other questions tagged warfare weapons weather middle-ages or ask your own question. Can cities and homes stop being functional during an impact winter where the only option is move on? Alternate alloys for weapons and armor? How to make my humans more cold-resistant? What weapon would be suitable for bats? Suitable melee or ranged weapons for weak mages?